This Ireland native is primed to take the RIBBF by storm. 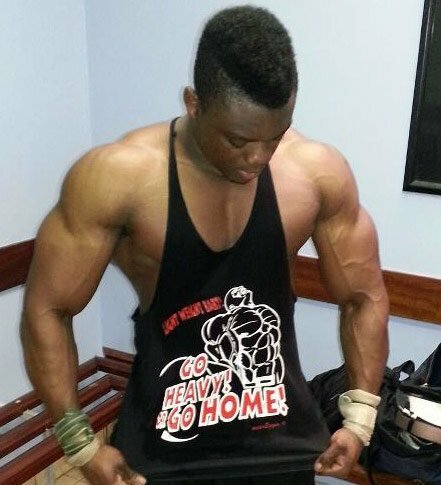 He harnesses motivation from Kai Greene videos and hits the weight room with a vengeance! I was extremely thin as a young guy and refused to take my top off at the beach. I was self-conscious of my skinny body. This led to me the gym— a makeshift one in the garden shed—at an early age. I had plans to attend college and worked really hard at school. The gym was my only hobby until, unfortunately, things didn't work out and my dreams of college were dashed. I couldn't get a job. I didn't know what to do with myself. In need of something to do with my energy, I found a lifeline in bodybuilding. At age 18, I hit it hard and started training seriously. I decided to compete in the RIBBF's first timer's category in October 2011. I came in fourth and later discovered I should've been in the junior category. I received positive feedback from the judges and talked to Tony Freeman about improvements. I was over the moon and knew I'd be back with a bang. In April, I entered the junior category in another RIBBF competition and won. I was thrilled. My training regimen is a two-a-day approach where I train twice a day and focus on one muscle group during each session at high intensity. I start each session with a warm-up set of pull-ups and 15 minutes of intense abdominal work. I train once on Saturday and take Sunday off. Cardio isn't part of my regimen because I have an active lifestyle. Sleep is very important, but I don't get much because of my work schedule. It's very important to drink a lot of water throughout the day. I get very little sleep due to my night shifts at work. I have one cheat meal per week, which is usually Chinese. Supplements aren't the key for me. It's all about the diet. My only supplement is whey protein. Bodybuilding is a competitive sport that pushes me to get better. If you want to keep at it, you have to work hard and improve; otherwise you're not going to make it. I love the gym. Being a personal trainer, I want to look the part and want people to look up to me. I have great friends and family who support and assure me that I can be whatever I want. They push me to achieve my goals in life. When I need inspiration, I watch videos of Kai Greene or replay my favorite movie of all time, "Pumping Iron." I'm training for nationals at the moment, which are coming soon. Hopefully, they go well and I can take it from there. Never give up. Just keep pushing no matter what. No pain, no gain. My all-time favorite is Kai Greene. He's very inspiring. It's great that he likes to teach others as well. I just started with Bodybuilding.com, but it's going to be a great help to my future bodybuilding career.